"Taniel is a powder mage, a flintlock marksman with the ability to imbibe common black powder to strengthen his mind, body, and senses, as well as shoot over long distances. Sent into short-term exile by his father, he’s supposed to see some of the world and cool his head, to learn something besides life in the Adran army. His arrival in exile, however, coincides with the eruption of a bloody new conflict as the colony of Fatrasta rises up against its Kez suppressers. 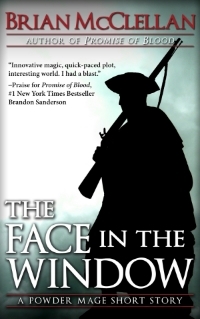 Taniel has certain talents that the Fatrastan militia could very well use, and he just can’t help but get involved…"
I hate to say that I have a new short story out, because "Face in the Window" isn't actually new. It came out in the February 6th issue of Beneath Ceaseless Skies, an online magazine dedicated to adventure fantasy and the erights have just recently reverted back to me. I have decided to repackage and sell it myself because so many people seem to have missed it, and because Amazon won't let me turn it into an audiobook unless I have it under my own name. I want to make something very clear. The story is still available for free from Beneath Ceaseless Skies, and I encourage you to download it from them, or to purchase the issue of the magazine where it was first published. If you'd like to get a copy from me, however, it is (or shortly will be) available from your favorite ebookstore. A comprehensive list with links can be found here. In other news, the new Powder Mage novella is looking great and will hopefully be out by mid to late June. I have a cover artist (the talented Rene Aigner, who did the cover of Forsworn) and a copy editor all lined up. It's going through the third group of beta-readers right now. If you're not familiar with the Powder Mage short fiction, you can check out all the others in Forsworn, "Hope's End," and "The Girl of Hrusch Avenue." I finally got around to uploading the Powder Mage short fiction to iTunes. You can now get your hands on both Forsworn and "The Girl of Hrusch Avenue" if you do your reading on iBooks. There was a small problem with "Hope's End" which I'm still trying to figure out. In other news, Beneath Ceaseless Skies is holding a giveaway of a signed UK copy of Promise of Blood. Check it out here. The newest episode of the Hugo-nominated Beneath Ceaseless Skies Magazine is out today, and guess what? It contains a brand new Powder Mage novelette! Taking place two years before the events in Promise of Blood, "The Face in the Window" relates the story of Taniel's trip to Fatrasta and his first meeting with a mysterious girl named Ka-poel. You can now read it for free on the BCS website, or you can support the magazine by getting it on Weightless Books or on your kindle for just $.99! Don't forget to check out the rest of the Powder Mage short fiction with Forsworn, "Hope's End," and "The Girl of Hrusch Avenue." 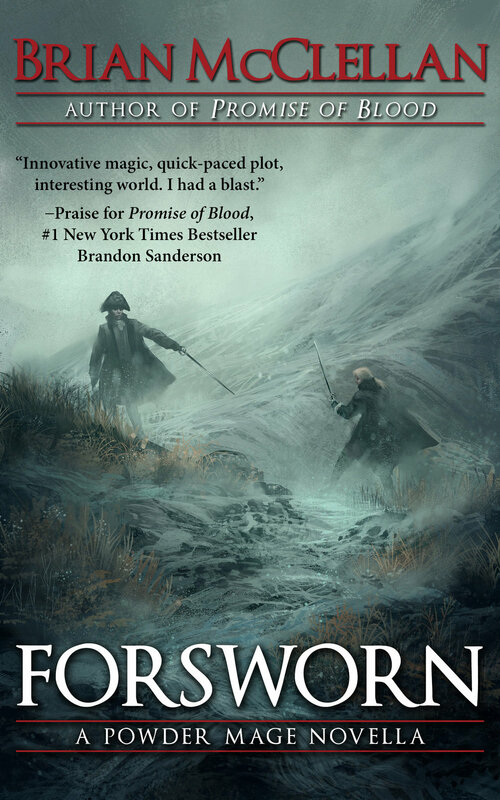 Forsworn: A Powder Mage Novella is now available for purchase. You can currently get it directly from me via paypal on this page or use the links below to find it at your local ebook store. If you're unfamiliar with my Powder Mage short fiction, you can check out the other stories as well: "The Girl of Hrusch Avenue" and "Hope's End." I've dropped a lot of hints recently (especially if you follow me on Twitter) about my latest little side project, a Powder Mage novella. It's coming along nicely. The cover art is finished and the manuscript has gone through numerous edits and two rounds of beta-readers. If everything stays on schedule, I'll finish another edit tomorrow and send it off to the copyeditor, then final edits next week and a release of 1/26/14 on Kindle, Nook, Kobo, and directly from me. The novella takes place 35 years before Promise of Blood. For reference, "Hope's End" takes place about 18 years before PoB and "The Girl of Hrusch Avenue" is about 10 years before PoB. "Erika ja Leora is a powder mage in northern Kez, a place where that particular sorcery is punishable by death. She is only protected by her family name and her position as heir to a duchy. When she decides to help a young commoner—a powder mage marked for death, fugitive from the law—she puts her life and family reputation at risk and sets off to deliver her new ward to the safety of Adro while playing cat and mouse with the king's own mage hunters and their captain, Duke Nikslaus."